Inishbofin is a small island in the west of Ireland. You get a small ferry from the tiny port of Cleggan . I love it and here’s a painting overlooking the harbour where the ferry docks. If you get a chance to go- seize it! Three watercolours from another workshop with John Hoar. Here is a snowy scene and two west of Ireland paintings. The large white cottages are of the east end of Inishbofin island, County Galway. Can’t wait to be back there in May. Here are three pictures from my visits to Ireland. The dark, broody mountain is Ben Bulben, near Sligo and immortalised by W B Yeats. 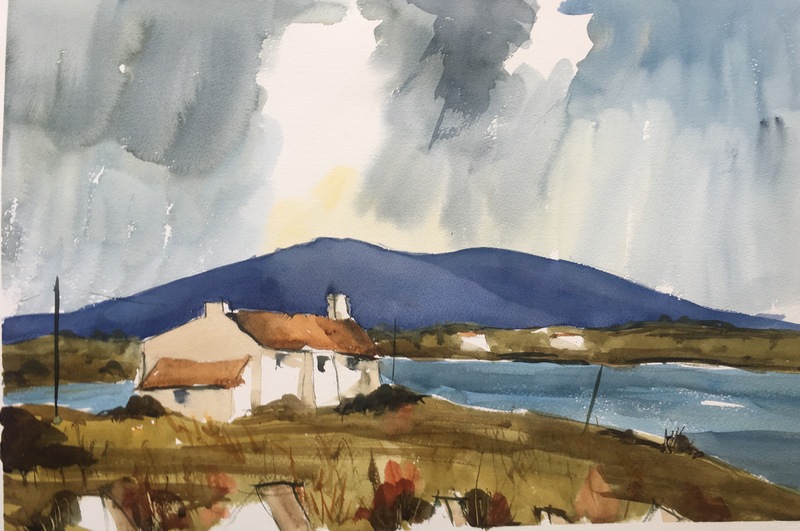 The view across the mountains of Connemara is painted from the delightful Derryinver Harbour and there’ a storm approaching a Donegal farmstead. Today I booked another week in Renvyle, Connemara for next May (2018). It’s one of the most beautiful places on earth and my personal favourite in my favourite country. So in celebration Iand anticipation I have painted this typical view today.